An interview with the owners and brewer of Twain's Billiard and Tap brewpub in Decatur, Georgia. strike a pose in the pub's brewhouse. 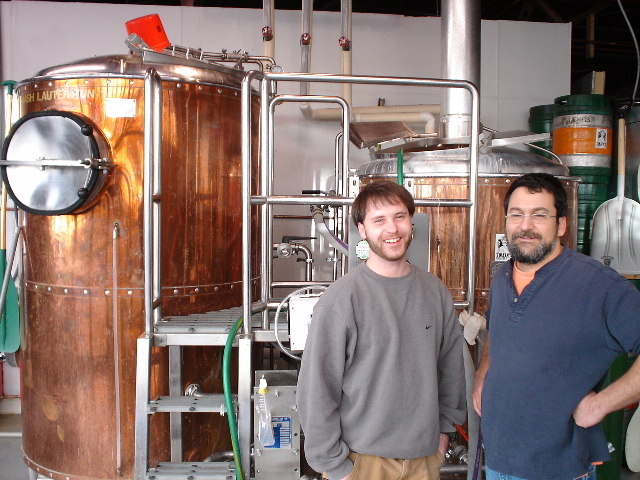 An interview with the owner and brewer. Twain’s Billiards and Tap (211 E. Trinity Place, Decatur, GA) has been a local favorite for beer, pool and pub grub for the past several years. At the end of 2006 Twain’s completed bar renovations and brewhouse construction and is finally producing their own house beers. Brewer Jordan Fleetwood’s first brews included a pale ale, ESB, brown ale, stout and golden ale. Twain’s owners and founders are brothers Ethan and Uri Wurtzel and their sister Talia Blanchard. Twain’s is definitely the result of hard work, vision and a touch of madness from these creative siblings. I recently sat down with Uri and Jordan to discuss the recent goings-on at Twain’s. Owen: How did you guys end up opening a pub in the first place? Uri: Well, my sister was the first one to look into the idea of a pool hall pub and she ended up in Decatur about 12 or 13 years ago. She soon realized it was a bigger project than she originally thought. My brother Ethan then moved here from Pennsylvania and decided he’d like to help out and become a part of the plan. Our father had a pool hall in Philadelphia that my brother and I had managed for awhile, so there was a little bit of a lineage there. Eventually my wife and I both ended up here – mainly so I could become a partner in the pub as well. That was 1996, and Twain’s has been pretty steady and growing in business since then. The brewpub addition has been a big step for us. Owen: What’s always been special about Twain’s? Uri: It’s a couple of things. It has always been a very friendly and informal place and has endeared itself to a lot of people – not just customers, but employees who stay here for a long time. It’s a comfortable place to be, and that’s a big part of what Twain’s was and still is. My brother and I had traveled to areas of the world known for good beers and we developed an interest in these beers. We wanted a pub where all our draft beers were microbrews and craft beers with no macros at all. We also enjoyed traveling to the Pacific Northwest, and this began our interest in opening a brewpub. Owen: What’s been the most difficult part of pub ownership? Uri: Similar to the worst part of being involved in anything in the service industry – the day to day unpredictability is tough – you never know what’s going to come up. You never seem to have a day off. Staying on top of it all and establishing an operation that runs itself is hard – you never quite seem to get there. Owen: What’s been the best part of pub ownership? Uri: The fun comes in creating a place where people can relax and enjoy being together and making friends. Serving something you can be proud of is also great – especially now that we are making our own beer. 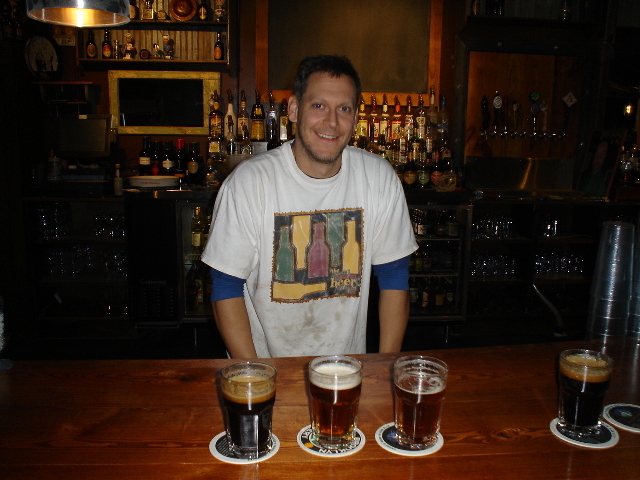 Ethan Wurtzel pours pints of Twain's house brews. Owen: What’s been done to the pub since the brewhouse was installed? What will patrons see when they visit now? Uri: Before there were basically three rooms to the place and a small kitchen – a dining room/bar and two pool rooms. One poolroom was smoking and one was non-smoking, but now Decatur is all nonsmoking. We broke down a wall between two rooms and converted one of the pool rooms into the new dining room/bar that goes up against the wall of the brewery. We took over a space within the building in back to put in the new kitchen and brewery. The new dining room/bar area is much bigger than before, and we still have a ten table pool room and an area for shuffleboard and other games. Owen: Was building the brewhouse difficult? Where did you find the used equipment? Uri: It was a difficult process – especially to do it in a timely fashion. It took a lot longer than we imagined. But once our brewer Jordan came on board, the process became easier because he knew what he was talking about and could visualize what his ideal brewhouse should look like. Since we were a family business on a budget, we went to a broker to find some used equipment. Eventually we found what we were looking for pretty much on the button – in terms of capacity and quality. The brewhouse came to us almost as one big package. We’ve had to replace some things. Our 1000 pound glycol chiller got ripped off from the parking lot when we left it out one night. That hurt. Owen: Are you glad to have Jordan as your brewer? Uri: Ethan and I are really happy to have Jordan at Twain’s to take on the brewery part of it. We feel really fortunate, and he’s done a great job in putting things together and producing a fine end product. He’s a terrific person to have around and has quickly become a part of the family here. Owen: Jordan, tell us a bit about your brewing history. Jordan: I started out admiring the glamorous position of a brewer and did a little bit of homebrewing. Big River Grill in Chattanooga gave me my first brewing job and basically trained me. I was there for a little over three years and then wound up getting hired at Dogwood in Atlanta and brewed there for about three years before Dogwood’s ultimate closing. I floated around after this and about six months later got hired at Yazoo in Nashville and brewed there for a year. Around that time I began to start talking to Ethan and came down to interview for this opportunity. I was a little homesick up in Nashville, so I’m glad to be back in Georgia. Owen: You had a beer at Dogwood that was your recipe, right? Tell us about that. Jordan: That was Youngblood’s Imperial Porter – we knew the repeal of the six percent alcohol law was on the way, and we talked about doing an attention-grabbing beer. We also wanted to put this beer into 22 ounce bottles. We converted the bottling line to work with the larger bottles, the law changed and the beer was done all at the same time – it was like clockwork. Owen: Which beer has been your most popular at Twain’s so far? Jordan: Everyone has been really nice because I’ve only heard good things. We can’t keep beer on tap because they are going so fast. The ESB is our biggest seller with pale and golden right behind that. Uri: The brown ale has also been very well received by all the patrons. I really think the stout is one of our best beers – very flavorful and rich. Owen: Have you had to brew faster than you expected? Jordan: Yes, it’s been a challenge. I didn’t expect in the first two weeks for our tanks to start drying up so quickly. We now have a 20 barrel tank that we didn’t have on line at first, and it’s helping out quite a bit. Owen: What are your plans for future beers? Jodan: Uri and Ethan have given me the freedom to try out new styles when I can. Our regulars will typically be golden ale, ESB, pale ale, IPA, brown and stout. Some things could change because our regular rotation isn’t set in stone yet. I’m shooting for an interesting seasonal to come out around March, and a high-gravity beer will probably show up on our list sooner than later. It’s pretty nice to have the freedom to make whatever I want. Owen: Any plans for regular events? probably on Thursdays. We’re also going to try some brewer’s dinners on Tuesdays where I will be around to answer questions about the beers and give brewery tours. Owen: Speaking of dinners, what type of food does Twain’s offer? Uri: We have a pretty appealing pub menu. We have the standards like burgers and a nice variety of sandwiches. Many people come here for our delicious Buffalo wings, which are pre-marinated in and served with a variety of different sauces. Our new kitchen has a pretty big capacity, and we’re planning on developing the menu and adding some interesting new items in the near future. We are thinking of individual pizzas and creative, rotating specials – some of which will incorporate our beers. Look for some spent grain pretzels as a standard appetizer – we are experimenting with those now. Uri: We will try to have Strongbow cider on draft alongside Jordan’s brews, and other than that we aren’t committed to having any other draft beers. With bottles, we are trying to continue our role as advocate for the microbrew community at large. We have a very nice bottle selection. In the future, we might want to have a guest tap that features other brewpubs or smaller breweries. Owen: Are you pleased with the renovated pub? Uri: The new place has been very well received, and we are trying to get used to the higher volume. Many people who have never been here before and saw it as a corner bar are now coming in. We have a lot more families now, and people are coming in for dinner and a beer – rather than being here for the nightlife. It’s great that the place looks fresh and new but doesn’t look totally transformed – it’s still a comfortable place for people to hang out. 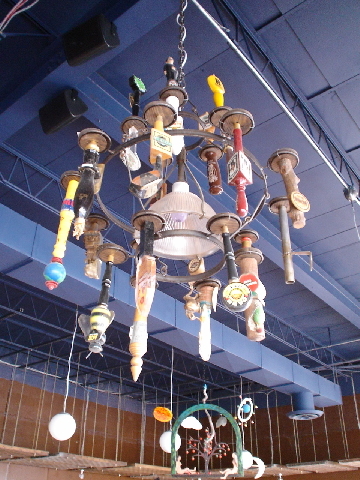 Twain's funky tap handle chandelier. Owen: Do you guys enjoy having Decatur as your location? Jordan: Yes. Decatur is a great beer town – the best beer city in the area. I enjoy the small community feel of Decatur too. Uri: I’ve been here coming up on ten years and I really like it. There’s a lot to offer in terms of things to do, but it still has a small town feel, and I like that. Owen: Why do you think that Decatur enjoys good beer so much? Jordan: That’s a tough question. Decatur has more of a friendly, community feel and social environment than downtown, fast-paced Atlanta. Decatur just seems to lend itself to a social-type environment. Owen: Having shuffleboard in a bar is pretty unique. What’s the story behind the shuffleboard? Uri: The shuffleboard is so popular that it has become one of the favorite activities in the pub. There’s even a shuffleboard waitlist on the weekends. I played shuffleboard out on the west coast quite a bit in the neighborhood bars in Seattle and San Francisco. Shuffleboard is not really an old person’s cruise ship game – it’s a fun game that requires a lot of finesse that lends itself to having a beer in one hand while you are playing. We thought it would work at Twains, and it has. Everyone should remember that we also have four dart lanes and plenty of pool tables. Owen: Where do you see Twain’s in 10 years? Uri: Well, I guess I would like to continue to have fun with it, and that goes for everybody involved. We want Jordan to enjoy brewing the beer and experimenting with new styles. Ethan, Talia and I want to continue having fun in making the place even more of a comfortable, fun pub for people to spend their time. Getting some new regulars to add to the atmosphere would also be great. We’d also like to add new traditions. We have a spring event to celebrate the end of prohibition, and on November 30 every year we celebrate Mark Twain’s birthday. The character of these events is very unique to Twain’s, and I’m sure that new traditions will grow out of our recent changes. Owen: Jordan, where would you like for Twain’s to be in ten years? Jordan: In Decatur. Really, I just want the place to stay as comfortable, as tight-knit and as much a part of the community as it is now. Owen: Any words to add? Uri: It’s exciting to be a part of place where we can learn from Jordan about making beer. We’re also glad to be a part of the larger beer-making community – getting to beer festivals, exchanging stories, ideas and encouragement with other people who are brewing is rewarding. I think for me one of the important parts of this whole process is that our beers are a locally made product by real people in a community, and this lends itself to healthy living. I’m glad we’re a part of the whole process.